Trap-Neuter-Return, commonly referred to as "TNR," is the only method proven to be humane and effective at controlling feral cat populations . With this technique, all the feral cats in a colony are trapped, neutered and then returned to the location where they were trapped. DO NOT try to touch a feral cat or remove it from the trap by hand. 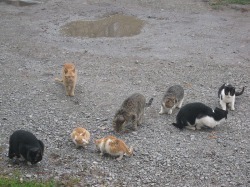 Only trained individuals should ever handle feral cats as they can be EXTREMELY dangerous!! If possible, get the cats used to being fed at the same place and time of day.You might try leaving the trap unset and covered with a large towel during routine feeding so that the animal will get used to seeing and smelling it in the area. Don't feed the cats the day/night before you are going to trap so the cats will be hungry. Be sure to notify others who may feed the cats not to leave food out either.Plan to trap so that you don't have to keep the cat too long before surgery. Trapping the night before is usually the best approach. Cats should not eat 12 hours prior to surgery. Plan your day of trapping carefully. Remember that if you trap an animal and release it for some reason, it is unlikely that you will be able to catch it again — they learn very quickly. For Humane Trapping Instructions please go to : http://www.feralcat.com/trapinst.html.